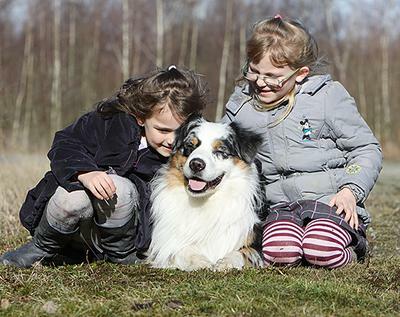 How To Train An Australian Shepherd How To Behave Around Small Children? Hi - our 20 month old female Australian Shepherd tends to get into trouble around smaller children, which is not a surprise at all given that they move quickly and suddenly. She does not have a lot of exposure to children in general, so it's difficult to work on training. She'll play nicely with a kid for a bit (never unsupervised), but then gets worked up and starts jumping up on them, nipping toward their face (this is exactly how she plays with other dogs, but not at all how she plays with us). Once she does this, she's hooked and she'll behave this way for the rest of the night with the same kid, no matter what the situation. We usually keep her harness on, sometimes with her lead, to control her better. I think she believes they are toys to be played with, but unfortunately not. Aside from the obvious - managing her arousal level, she is young/they are young, kids move quickly causing herding instinct to kick in, etc. Any tips you can share to make introductions and time in the same room together more productive and enjoyable for all would be appreciated. Thanks. Comments for How To Train An Australian Shepherd How To Behave Around Small Children? Have you considered an electronic training collar? We have a 2 year old that we adopted from someone who had small children and couldn't keep him. I don't know the exact situation but I suspect it was something very similar. Since we are older and don't have kids nearby it hasn't been a problem for us. One thing I did for my dog was to get him a training collar, the type that will do more than just shock, also vibrate or just beep depending on what signal you send. I have only shocked him once and likely I wont ever need to do it again. Once I put the collar on him he is like a different dog. When we go on our daily hikes he loves to run through the woods as fast as he can but it used to be he took his time coming back after being called. Now all I need to do is signal him with a beep and he turns instantly and runs back. Just a changed dog. He can be aggressive towards other dogs but with the collar on he drops the aggressiveness and comes right back and pays attention to me. Anyway I wonder if this would work for your dog. It helps that my Aussie really loves to please (he was that way before the collar) so giving him a beep just serves as a reminder to listen up and pay attention to the wants and needs of his boss! Hi, relating to Aussies around young children, our Aussie is 2, our grandchildren live in a different state and visit once a year. We have never allowed our Aussie to jump, if she tries we just turn out back on her. They get on very good together,like you never unsupervised, when Gemma becomes a little too excited we have her drop and stay until she is calm, we use these times to educate our young grandchildren. So they all end up having quiet time together and do art during this period, as a reward for helping train Gemma to quieten down. The only things I could suggest is,walk your Aussie around children, if parents allow their children to pat your Aussie, use food to reward and have her sit whilst they pat her. Like us,as we don't have regular contact with small children, I try to socialise her where there are children. The other thing I would suggest is either obedience or agility training, this helps with having a well behaved dog, the agilty is great for Aussies in stimulating this brains, plus lots of boredom busters, the other thing is maybe have your visiting little children assist you with playing, again lots of rewards with food.